Grand Lake Eyecare is pleased to offer a wide range of optometric services, eye care products including eyeglasses, specialty eyewear, frames, and contact lenses. Our staff is happy to help however we can. 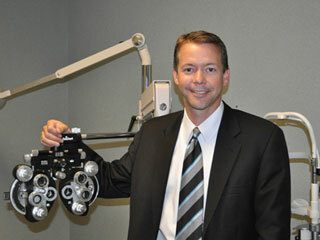 Dr. Gerlach performed his undergraduate work at The Ohio State University, where he majored in Pre-Optometry/Zoology. He was accepted early into The Ohio State University College of Optometry after three years of undergraduate work. He received his Doctorate of Optometry in 1999. During his time at Ohio State, Dr. Gerlach received extensive ocular disease training at the Dayton VAMC externship site. Dr. Gerlach is board certified by the American Board of Optometry, is a Fellow of the American Academy of Optometry, and is a member of the American Optometric Association. He is past-president of Big Brothers/Big Sisters of Mercer, Auglaize and Van Wert counties, past-president of St. Henry Community Club, past-Exalted Ruler of The Mercer County Elks, and past-zone governor of the American Optometric Association. He has participated in ophthalmic mission trips to Nicaragua, Bolivia, and Guatemala. Dr. Gerlach, wife Melissa, daughter Sophie, son Owen, and golden retriever Zoe, reside in St. Henry. Dr. Lindsay Dues graduated with her bachelor’s degree in biology and chemistry from Bowling Green State University in 2008. She then studied at The Ohio State University College of Optometry and received her Doctorate in 2012. Dr. Dues enjoys working with patients of all ages, from pediatrics and vision therapy to geriatrics and low vision. Dr. Dues has had the privilege and opportunity to participate in several optometric mission trips to Guatemala, Honduras, and Nicaragua. As a member of Students Volunteering Optometric Services to Humanity, she helped bring donated glasses and eye care to those in need. She is also an active member of the American Optometric Association and has served as a past zone governor of the Ohio Optometric Association. Dr. Dues, husband Andy, sons Carter and Noah, and dog Bailey reside in St. Henry. Dr. Christie Grieshop joined Grand Lake Eyecare in 2014. She completed her undergraduate studies in biochemistry at the University of Dayton and earned her Doctor of Optometry degree with honors at The Ohio State University. Dr. Grieshop is devoted to providing high-quality eye care with compassion to patients of all ages. 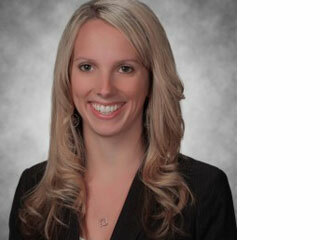 She is a member of the American Optometric Association and the Ohio Optometric Association. Dr. Grieshop, husband Brandon, daughter Gianna, son Blaise, and dog Tressie reside in Coldwater. They enjoy spending time with family and friends and are active members of Holy Trinity Catholic Church. Our team of eye care professionals is experienced and friendly. We’re here to help all patients with understanding their benefits, scheduling appointments, and fulfilling their eye doctor’s orders. Our opticians can give you guidance in picking your perfect pair of eyewear, and our friendly office staff are knowledgeable about billing and benefits coverage. Learn more about our team here! Board Certified Paraoptometric Assistant (CPOA) and frame selection specialist with over 18 years of optometric experience. Board Certified Paraoptometric Technician (CPOT) with over 11 years of optometric experience. Board Certified Paraoptometric Assistant and Coder (CPOC) with over 11 years of optometric experience, insurance and billing specialist. Board Certified Paraoptometric Assistant (CPOA) with over 23 years of optometric experience. Board Certified Paraoptometric Assistant (CPOA) with over 7 years of optometric experience. Board Certified Paraoptometric (CPO) with over 6 years of optometric experience. Board Certified Paraoptometric Assistant (CPOA) with over 6 years of optometric experience. Board Certified Paraoptometic (CPO) with over 3 years of optometric experience. 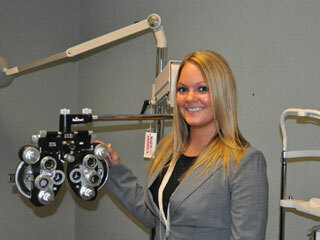 Certified Paraoptometric Assistant (CPO) with over 2 years of experience. Board Certified Paraoptometric (CPO) with over 2 years of optometric experience.